Sometimes a regular bar just wont cut it, and you shouldn't settle. London has one of the worlds best eclectic mix of unusual, quirky and the just plain odd bars. 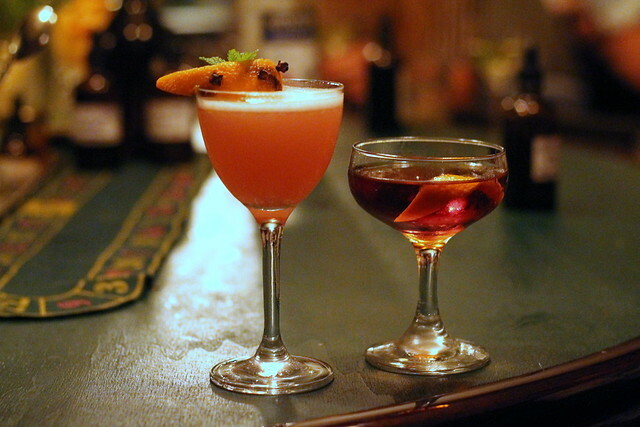 If you are looking for something a little different for your drinks night, then read on. The Morrocan Sky Riad at Level 40 The Gherkin. 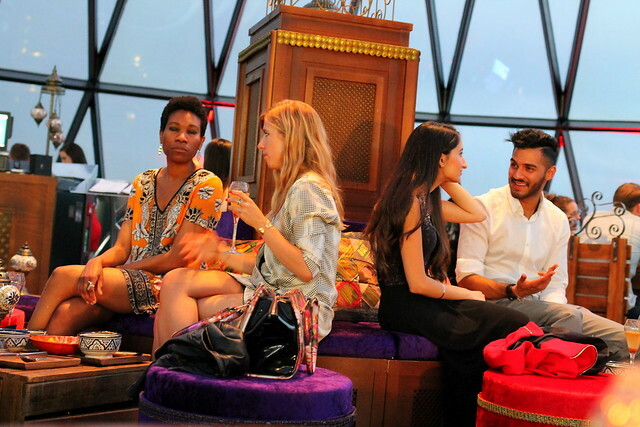 First of all, I think the Gherkin itself is an unusual drinks spot, but through into the mix that the top floor- level 40- has been transformed into a Morrocan Riad just makes this even more unusual. With velvet stools, jewel colored cushions and wooden tables, it has a great evening vibe, and if you are looking to impress a date, well you don't get much better than the views from here. 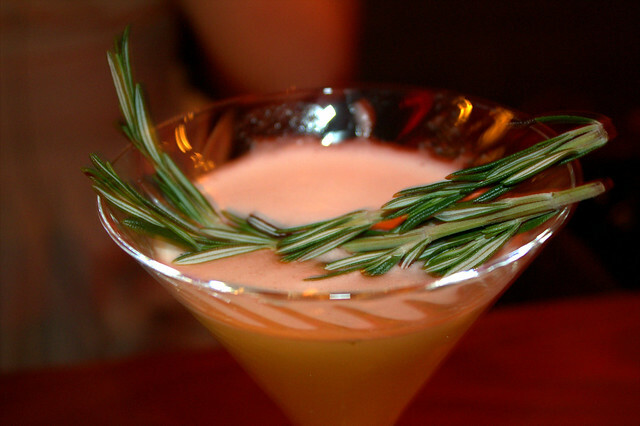 Cocktails are all made with a Middle Eastern twist, so think Saffron Gin and Honey cocktails. BYOC is a most unusual concept, but one that actually rocks. So it is a bar without any booze. Now before I loose your there, the genius idea is that you pay £25 entry and bring your favorite bottles of spirits, then the barmen will make up any cocktails you desire using juices, garnishes, syrups and jams. Incase you are skeptical, the cocktails they create are just fantastic. Oh and it's a cool 1920's casino theme too. Vinegar? In cocktails? Fear not ye of little faith. It may be odd, but it works very well. Try the Mon Cheri, a chocolate, cherry and apple vinegar, with Grand Marnier and Pampero Añejo. A sweet but rich flavour, it's rather unusual, something very different to the standard fruit based cocktails. Also Bart's itself is rather a quirky little bar. It's actually located in a block of flats, and you have to knock on the front door to enter. All very clandestine. Cafe de Paris is a club in the West End famed for its rather grand decor and it's frequent celebrity guests. However on a Friday and Saturday evening before the club opens, they host a cabaret show. 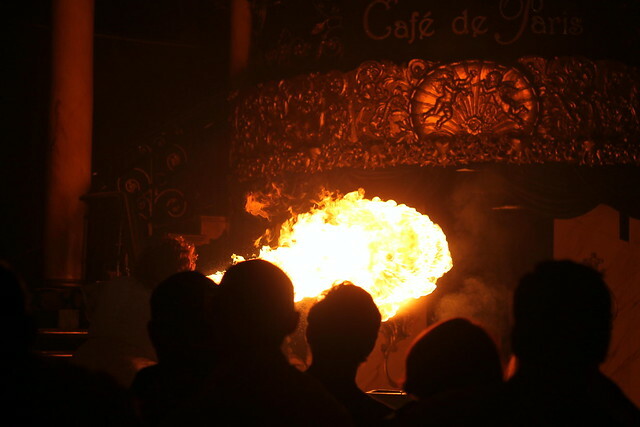 With acrobats, fire breathers and daring stunts it's not your usual quiet drink. They do have a dinner sitting, but upstairs in the gallery they have a couple of bars for drinks and the show. Scarfes Bar at the the Rosewood Hotel plays host to a series of cabaret evenings on a Sunday. I feels like you've stumbled into some random gentleman's club. It's definitely not conventional cabaret, it's more like stumbling into an eccentric upper class house party in the middle of London, hosted by a rather debaucherous couple who've had too much champagne. Take your seat in the bar, sit and chat with friends, all whilst singer's, contortionists and exhibitionists graze around you. Rather surreal for a Sunday bar. Michelin starred Lima's little sister, Lima Floral is famed for it's Pisco Sours. In true basement bar fashion, it's booths all round and bar staff who are more than happy to do shots with you. However it is their quirky cocktail menu that makes it a worthwile visit. Try this horny devil- the Cuento del Diablo made with fresh chilli pepper infused luna Pisco, orange liqueur, strawberry and lime juice. 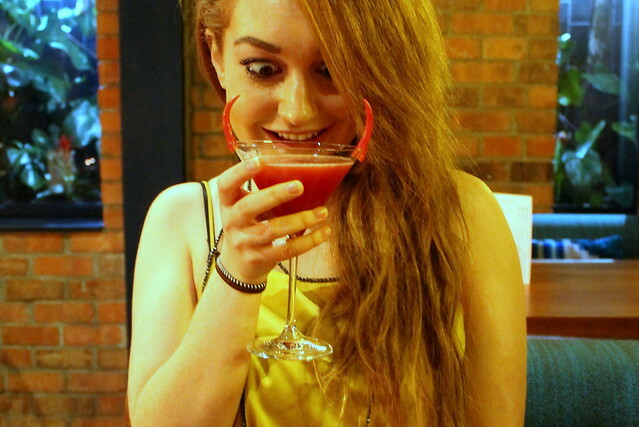 It's got a right kick to the fruity base, which will get any night started with a bang. The Polo Bar at The Westbury doesn't scrimp on the details. Opulent yet it still has a relaxed feel to it- even if it does have Swarovski Crystal fittings and custom Fendi detailing! 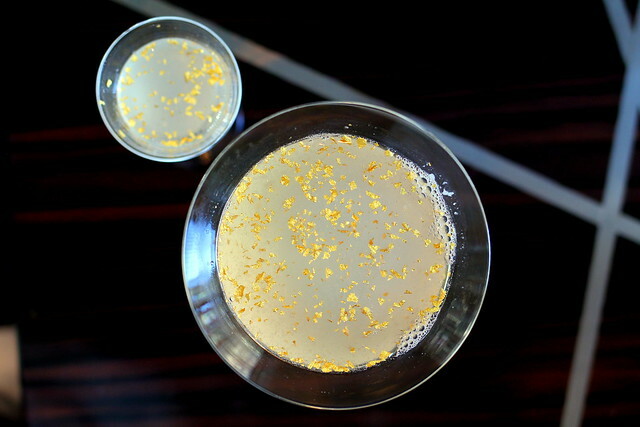 So it should come as no surprise then that they do gold flaked cocktails. If that isn't quirky for you, I don't know what is. Plus they have done something rather genius. Us girls, we love to share, passing around our cocktail from person to person. Well The Polo Bar have devised a way to not let you loose precious liquid. By giving a small shot of your cocktail with it, so your partner can try it all for themselves. What a genius! Finally, the quirkiest most unusual bar goes to... Camden Beach. 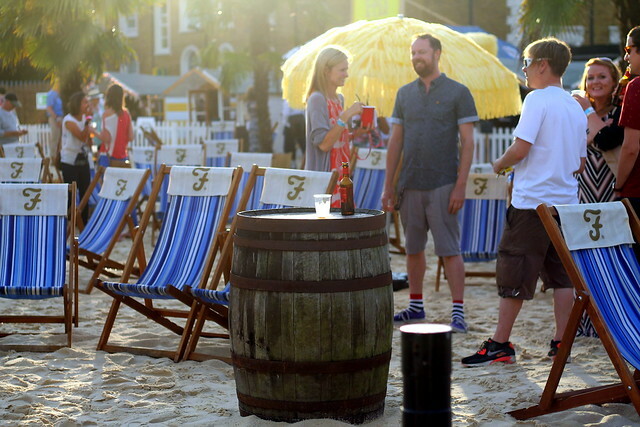 The roof of the Roundhouse is transformed into a beach every summer, with a DJ, deckchairs, Mr Whippy and lots of bars. Oh and real sand in case you were wondering. Beers, cocktails, even some champagne if you are feeling more LA than Brighton. You've found some absolute gems here - sad to say I've not been to a single one of them!! Want to help educate me?! looks so fun! I can't wait to visit london soon. I'm going to the Camden Beach next Friday if the weather permits - can't wait! All of these places sound really cool though, especially the bring your own cocktail one! Thanks for the great tips.